Free ride for dirty oil, border checks for people. But which is more dangerous? It's one of those typical injustices of capitalism that money, capital and dirty, earth-destroying, toxic oil products, have more right to cross borders and move around the world than do people - often including people who are trying to flee the impact of toxic oil products or governments who repress their population to protect foreign money and capital. So, we shouldn't expect any different sort of behaviour from the Canadian and American government in relation to their own populations. And that's exactly what they're doing. As Canada and the US try to push forward with their multi-billion dollar pipeline of liquid death, it seems the US is also trying to find ways to put up fences and surveillance cameras along the 6,400 km border that we share. Why? For national security, of course - which means restricting the movement of people. 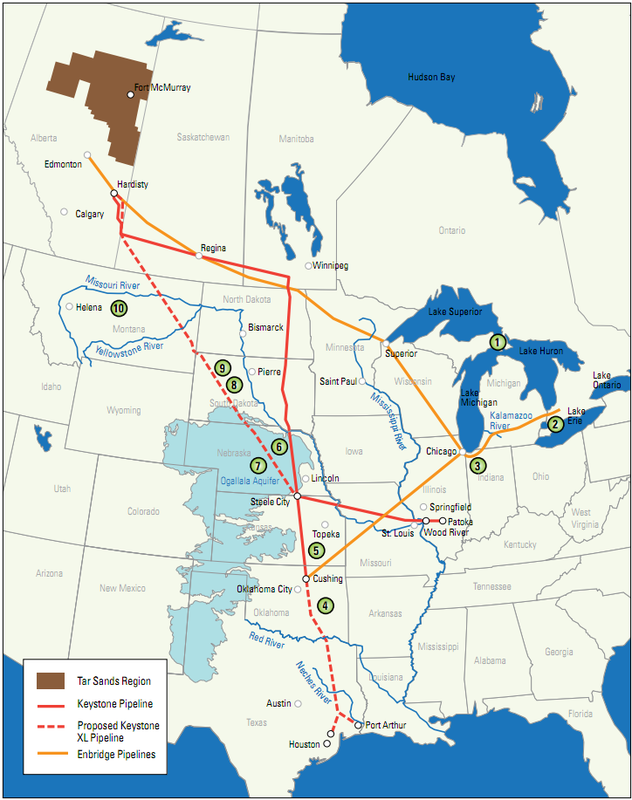 It's worth noting that the security of the Keystone I pipeline and the rogue oil that passes through its innards is rather less secure than would be the border. In one year of operation the pipeline that was supposed to only have one spill every 7 years had twelve. This high rate of spillage is consistent with the experience of pipelines in Alberta with speculation that dirty tar sands oil is highly corrosive, compared to other forms of oil. Of course, it doesn't help that TransCanada, the builders of the pipeline, are apparently willing to use cheap, second rate steel and is petitioning the Canadian government for the right to abrogate existing laws on steel thickness, as well as maximum pressures allowed within the pipe. It has to be said that as a result of past practices, TransCanada have been ordered to dig up whole swathes of pipe for replacement. TransCanada is digging up 10 sections of a new, $5.2 billion crude oil pipeline, including one in Missouri, after government-ordered tests identified possibly defective steel may have been used in the construction. And if you think that a couple of people sneaking across the border to sell pot in North Dakota is worth laying on fences, cameras and motion detectors (as opposed to, say, de-criminalizing marijuana) then you ought to lose your mind over the fact that oil leaks in the mid-west drain into the soil, which then sinks into the Ogallala aquifer - an underground sea that provides 30% of the groundwater for US agriculture as well as drinking water to populations stretching from Texas up to South Dakota. The health of millions of people could be directly affected by poisoning this key water source - not to mention the economic impacts. Of course, the Tory government believes people who oppose this "national security" disaster in the making are "extremists", including the Official Opposition, the NDP. This only demonstrates that the no price is too high for Canadian and American workers to pay in order to ensure that the Tories' buddies in the oil industry make fat profits. It doesn't matter of indigenous communities suffer high rates of birth defects downstream from tar sands projects. It doesn't matter if the drinking water of the entire mid-west of the USA is poisoned, ultimately leading to tax payer funded clean-up. And if you think any different, then you are an "extremist". However, spending billions to stop a few people from sneaking across a border that's supposed to have been opened since Free Trade, that's rational. Remember When The CAW Was A Militant Union? Did NATO Kill The Libyan Revolution?